We like to lots of things, many of which appear on other pages: music, swimming, soccer, diving, surfing, homework, more soccer, trains, funfairs, screens, mountain biking, skiing, cars, stamping, photo albums, more soccer, to mention but a few. Not all of us like to do all of the things, but some we do have in common. Soccer is our number one hobby. Although Daphné lost interest after only one year, everyone else kept at it or keeps at it for years and years, at home if not in competition. Most of this page covers some of our activities that did not fill a page themselves. We spent a lot of time bike riding, until the older children started going their separate ways, that is. Here we are in late 1996 in front of Marian House before it was sold. Marian House was Grandma's house in Marlow where Ian lived as a teenager. 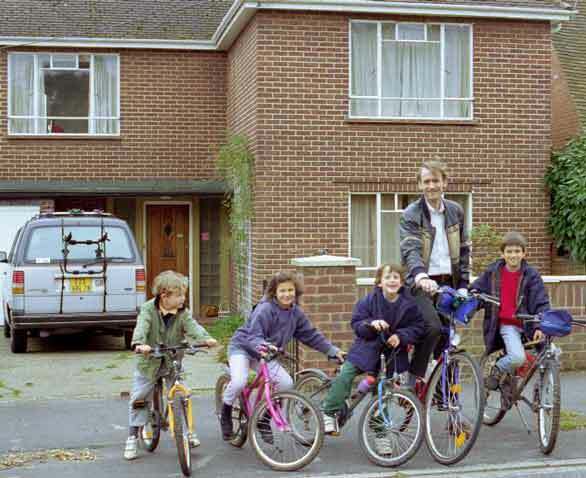 The Ford Aerostar (here's another one of our first minivan) that carried the six bikes and all our luggage from France is in the driveway. On the way home, driving along the M25, the motorway ring road around London, at 70mph, one of the bikes on the roof flew off into four lanes of freeway. Ian recovered it with the help of a couple of friendly lorry drivers who stopped traffic with their trucks so that he could cross two lanes of freeway and collect it. Repairs were necessary! Marian House looks completely different now. We sold it to Andrew Milsom, the agent handling the sale for us after mum died (no conflict of interest there, right Andrew! ), and he and his wife redid everything, bringing it up to date and considerably enhancing its value. There's a picture of Andrew outside his principal office here. Biking itself is different now too. Nick and Daphné began driving in 2003 and 2004 respectively, and Alban in 2007. The family no longer bikes together. That feels bad. It's the way it is, of course, perfectly normal, but still. Those were fun times. For a while, Alban took mountain biking to the point of competition, but then he let it go. 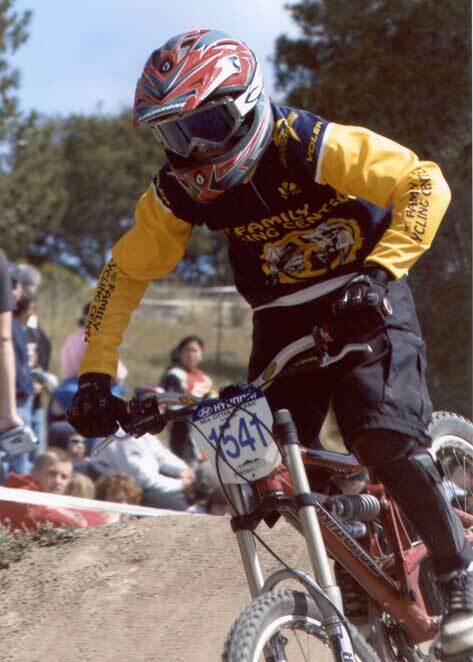 The photo was taken at Laguna Seca in 2004, the Sea Otter Classic. Alban fell, but got back on and still finished honorably. 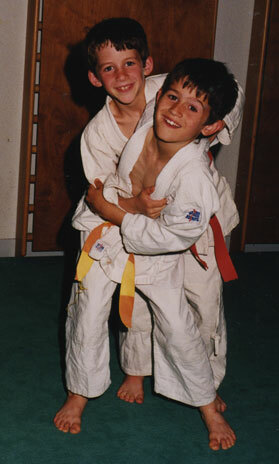 Before leaving France, the childrens' sporting activity was principally judo. All four of the older children joined the local club at one time or another. 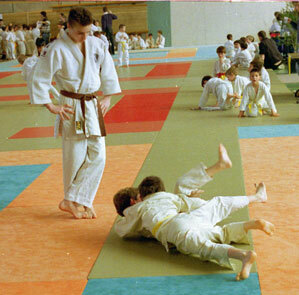 Below is Nick at a tournament in Gif-sur-Yvette in May 1995. In the lower photo, he's posing with David Lowenfeld, a good friend from our time outside Paris. Gardening is sometimes more of a duty than a hobby, especially when you live in a forest which invades and overpowers with alacrity most of what you try to cultivate. Once the driveway is cleared of leaves and dirt after each day of rain, and the entire property cleaned up and trimmed a couple of times a year, there's not a lot of energy left. But we do make an effort, and by "we" here we mean Marie-Hélène! 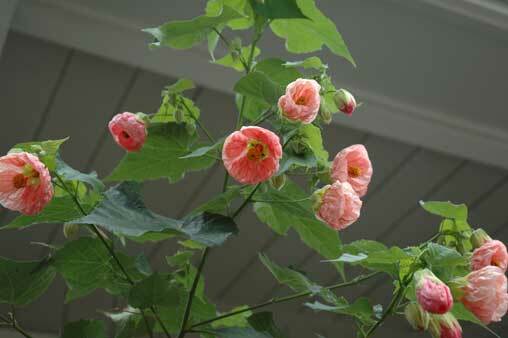 The hummingbirds love the abutilons, and give us a show whenever they flower. On the right is the one cultivated space that we preserve in the midst of our forest. 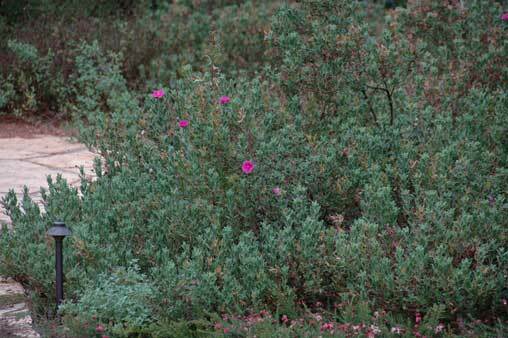 The deer tend to eat the prettier plants, almost anything with petals, and they tend to eat a lot. The weeds seem to have several growing cycles each year. But in the springtime, we have our own little flower show. 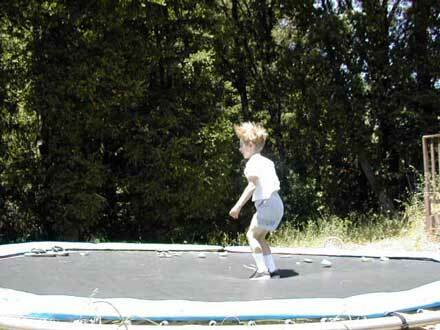 The most successful toy we ever bought is the trampoline. We've replaced the skirt around the edge twice, and the springs once. The boys just love it, and use it again and again and again. On the left, the only way that you can tell that Charlie is landing is his hair standing up. 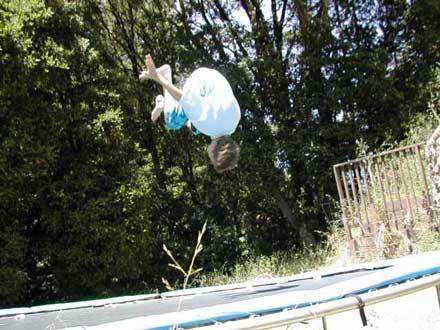 Below, the acrobat is Alban. He always makes it look easy. 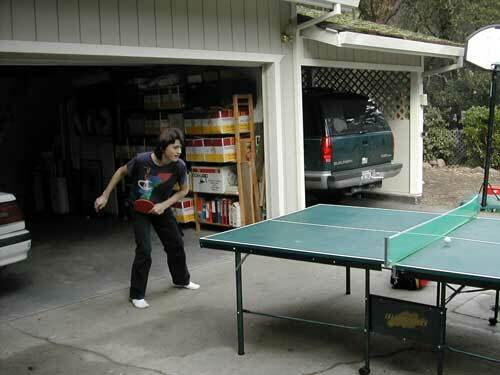 Here's a more occasional hobby, occasional because we never seem to be able to hang on to a ping pong table for very long before it gets broken. 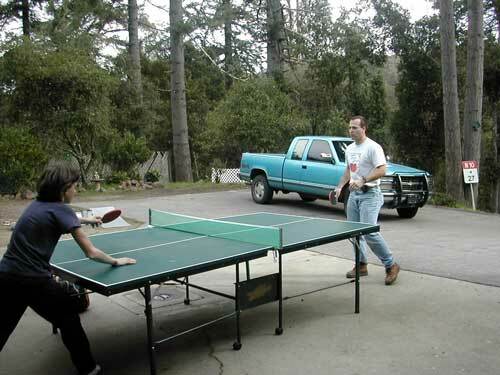 These shots were both of Nick and Dave playing ping-pong in early 2003 (before the garden was planted) in front of the house. Dave is a good friend of the family: another photo of him is here.